In the wide, field-guide-ish sense, Pachyella clypeata is a small brown cup fungus that can be recognized by its growth on soggy logs, its somewhat gelatinous (rather than brittle) texture, and the fact that it clings to the wood fairly tightly, so that it looks flat and only the very edge of the mushroom can be easily lifted. Strictly speaking, however, microscopic analysis is probably needed to separate Pachyella clypeata from several other North American species of Pachyella, since they look more or less identical to the naked eye. 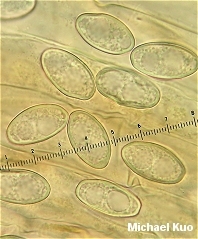 Pachyella clypeata has smooth, unornamented spores; the other species do not (see Pachyella punctispora for an example), or are much smaller. Thanks to Linda Sears for collecting, documenting, and preserving Pachyella clypeata for study; her collection is deposited in The Herbarium of Michael Kuo. Ecology: Saprobic; growing alone or in small groups on rotting wood (primarily the wood of hardwoods) that is usually water-soaked; spring, summer, and fall; apparently limited to eastern North America, but possibly widely distributed. 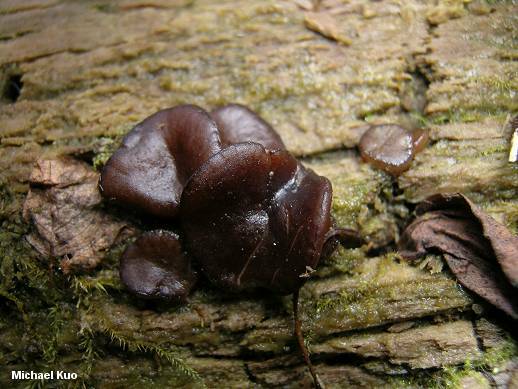 Fruiting Body: To 8 cm across but usually 2-4 cm across; cushion-shaped when young, soon becoming saucer-shaped or shaped like a flattened cup; broadly attached to the wood so that only the edges can be lifted away from the substrate; upper surface sticky when fresh, medium to dark brown, sometimes with a hint of red or purple, smooth or wrinkled, fading with age to tan; without a stem; flesh somewhat rubbery or gelatinous when fresh, sometimes becoming yellowish when torn. Microscopic Features: Spores 18-25+ x 13-16 µ; smooth; elliptical; usually with 2 oil droplets. Asci with bluish tips (at least when young) in Melzer's reagent or IKI; 400-500 x 20-25 µ. Paraphyses cylindric with clavate or merely rounded apices; to about 10 µ wide; brownish in KOH, reddish purple (when fresh) in Melzer's reagent. Excipular surface with many thread-like elements embedded in a gel, creating a palisade. REFERENCES: (Schweinitz, 1822) Le Gal, 1953. (Saccardo, 1889; Seaver, 1928; Pfister, 1973; Smith, Smith & Weber, 1981; Phillips, 1991/2005; Barron, 1999.) Herb. Kuo 11050502, 10081201. Kuo, M. (2013, January). Pachyella clypeata. 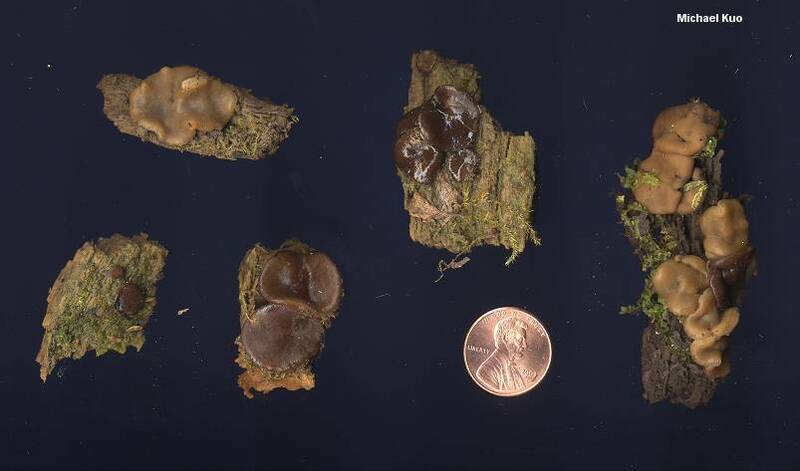 Retrieved from the MushroomExpert.Com Web site: http://www.mushroomexpert.com/pachyella_clypeata.html.